With the right selection of fresh flowers, whether arranged as a set display or simply as a well placed vase you can create an elegance that will lift everyday living areas adding colour, vibrancy and fragrance. Design features can be enhanced and a stylish theme can be provided throughout the home. The decision has been made, you are going to sell your home. But now the real decisions start. Sale or Auction, do you paint and repair. What can you do to really showcase your property. Inspections start almost immediately. You want your home to be at its very best. The furniture has been shifted. Cleaning, polishing and preparation have been completed. Now every viewing aspect has been perfected. All of your home’s best features are stylishly presented. But yet, there is still something missing – its about creating elegance and style. Fresh flowers and floral art can draw different elements within your home together. Colours can be co-ordinated simply and tastefully. Furniture and architecture can be complimented and linked. Your florist is well trained to advise you on all of these aspects. They will recommend the best ways to enhance the look of your property with fresh beautiful flowers. First impressions are lasting impressions. An inviting fragrance immediately sets the tone of a visit. Whether it is wintersweet, the spicy fragrance of seasonal boronia or the delightful intoxicating aroma of gardenias. There is a wealth of opportunities to choose from. Natural fragrances will immediately bring your home to life. Floristry is a love affair with flowers, a special gift of creativity. Your florist takes great pleasure in sharing the benefit of their experience and their art with you. Discuss your needs with them, invite them to your home for an inspection. Let your florist advise you on how to display your property to its best advantage with flowers. 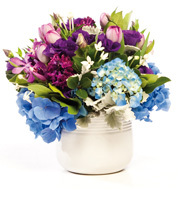 The best florists select and purchase all of their flowers and foliage from The National Flower Centre. The National Flower Centre has the freshest and most extensive variety of wholesale flowers in Melbourne Victoria produces the majority of Australia’s cut flowers. By purchasing fresh flowers from you local florist you are supporting our rural sector. Whatever you can do to present your home in its best light should be considered. Fresh, creatively designed flowers are an effective way of enhancing the natural appeal of your home. Ultimately it means you gain the best price for your home, and that is what it’s all about. Many of Victoria’s leading Real Estate Agents choose to advise customers to place fresh flowers in advance of an inspection. In fact if you forget, some agents will arrange for florists to deliver on inspection day. As spring arrives, the Real Estate market moves into high gear. It is a very competitive market and anything you can do to provide a slight edge over other properties is a winning move. FRESH FLOWERS all year round, provide a beautiful backdrop to the most cherished possessions in your home. So remember when you aim to sell, Fresh Flowers are an imperative. Your florist will help you select to suit your particular budget. They can advise you on a complete floral theme utilising intricate floral art or simply assist you and recommend suitable seasonal flowers such as Daffodils, Asiatic lilies, Iris or Poppies. As well they will be happy to pass on some inside knowledge on simple presentations, longevity and placement. Each room in your home can be enhanced by a floral arrangement that reflects either the décor or colour scheme. Certain flowers lend themselves to particular areas. Roses and Lisianthus lend a romantic touch to the bedrooms. Exuberant Gerberas and Sunflowers will lift your loungeroom. Elegant Iris and Lillium work well in the dining room.